A woman looks at the homepage of the clothing house Barabas on Tuesday. 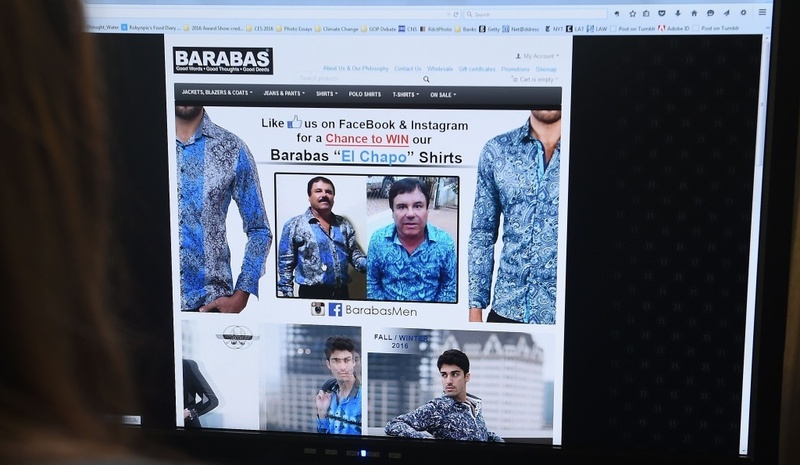 At the time, the site featured two photos of Mexican drug kingpin Joaquin "El Chapo" Guzmán. Today the site shows a different ad — one which, again, stars El Chapo. Today, if you head to its homepage, you'll see its name, its slogan — "Good Words, Good Thoughts, Good Deeds" — and a gigantic ad pairing pictures of El Chapo and a Barabas model. Barabas identifies it as from the "Fantasy" line, and suggests the shirt's pattern is "simple, clean and works well together." We'll leave that to you to judge.